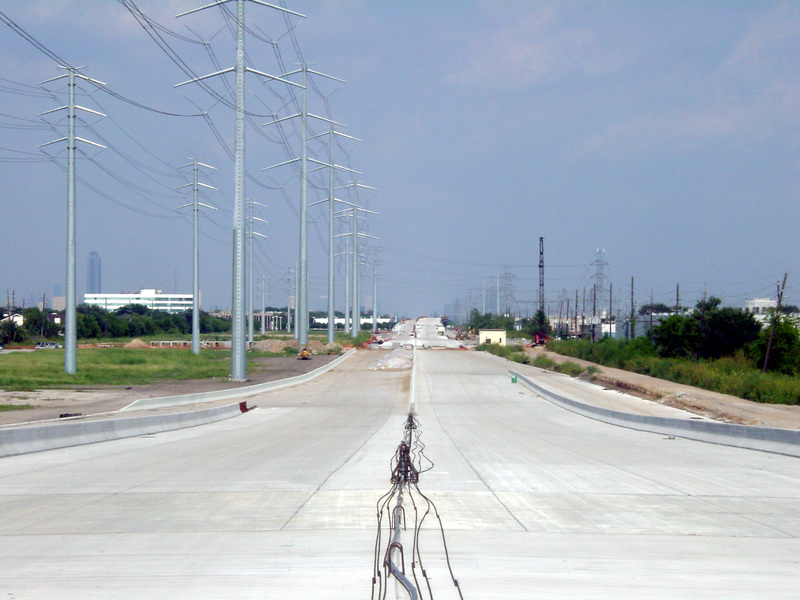 The first phase of the Westpark Tollway is nearing completion in October 2003. I took these photos in August 2003. 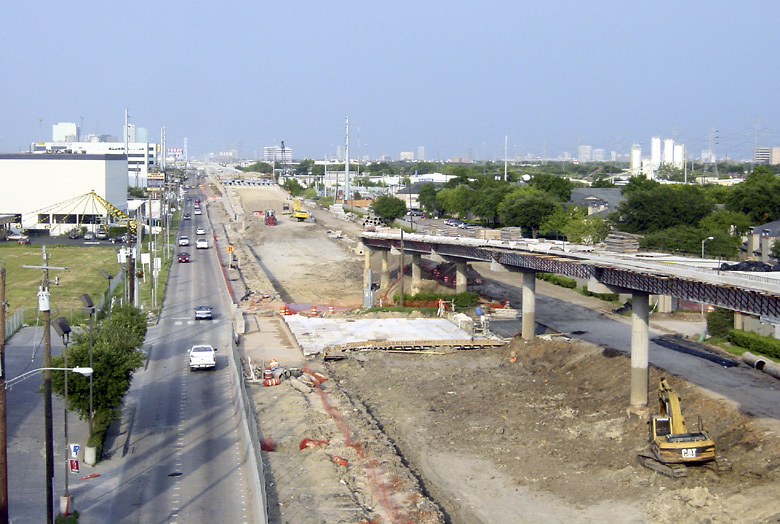 (Click for high resolution) This view looks south along the Sam Houston Tollway/Beltway 8 at the intersection with the Westpark Tollway, with the Westpark Tollway structure under construction. 17-August-2003. 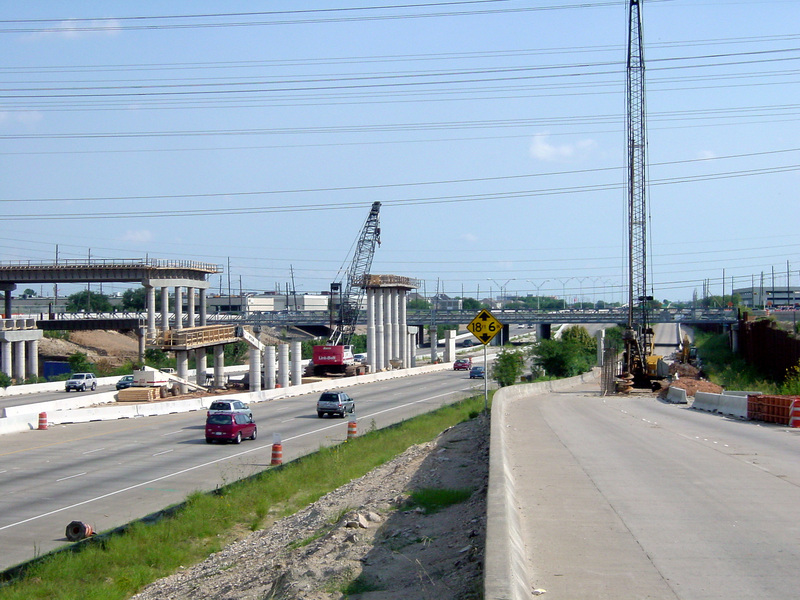 All the connections at the Sam Houston Tollway and Westpark Tollway are below grade. This is the excavation for one of the connectors. This connector will be two levels below grade. 17-August-2003. 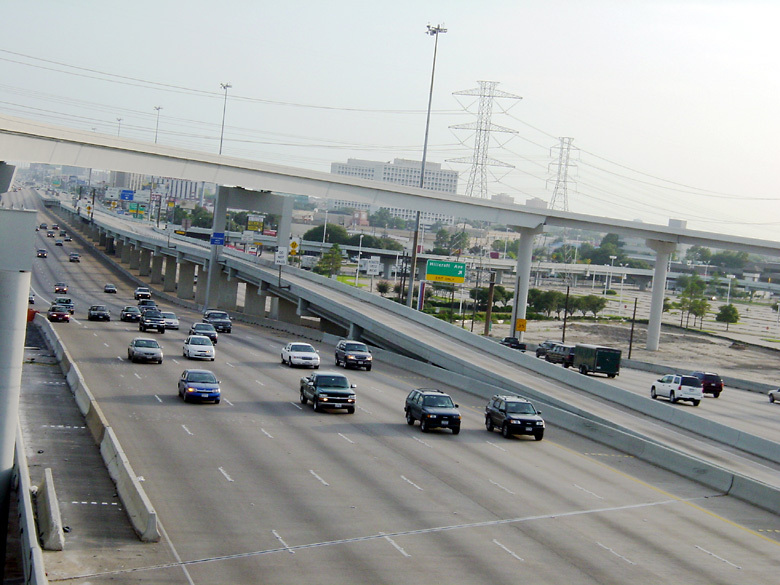 (Click for high resolution) This view looks east along the Westpark Tollway just east of Beltway 8. 17-August-2003. 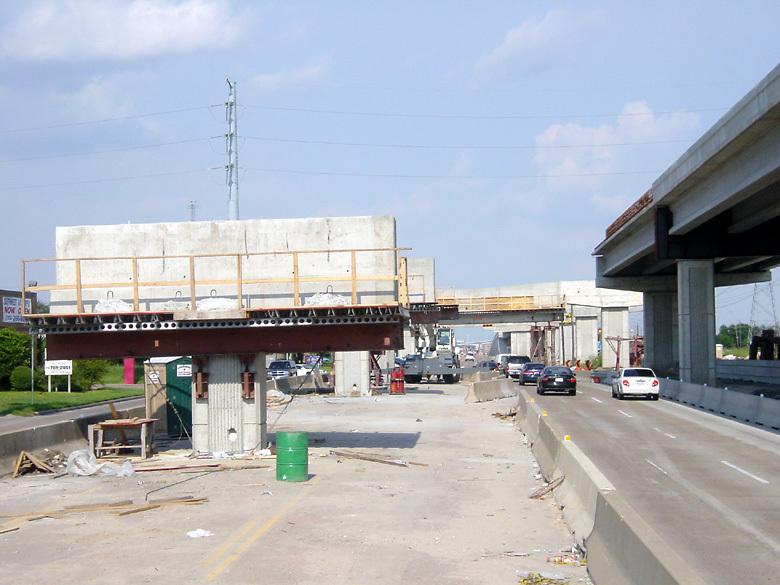 This view shows the exit ramp structure just east of Fondren. 17-August-2003. 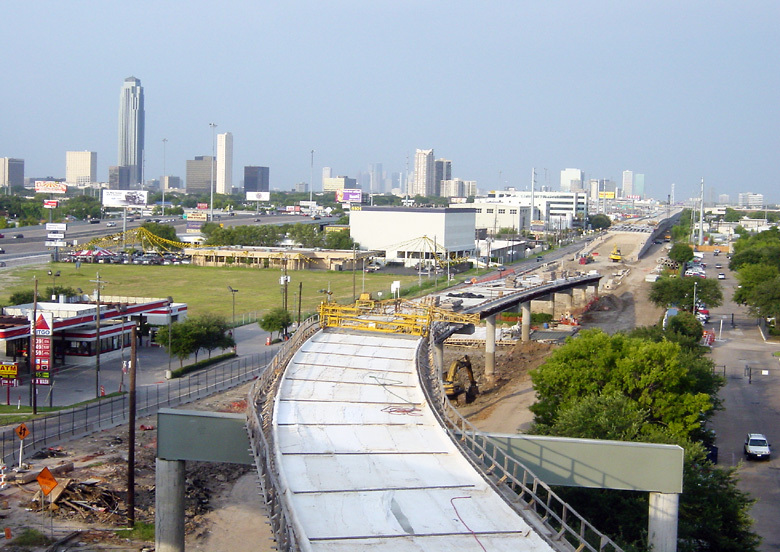 This view shows the exit ramp that drops into the middle of Westpark Road. 17-August-2003. (Click for high resolution) This view looks east at the intersection with the Southwest Freeway (US 59). 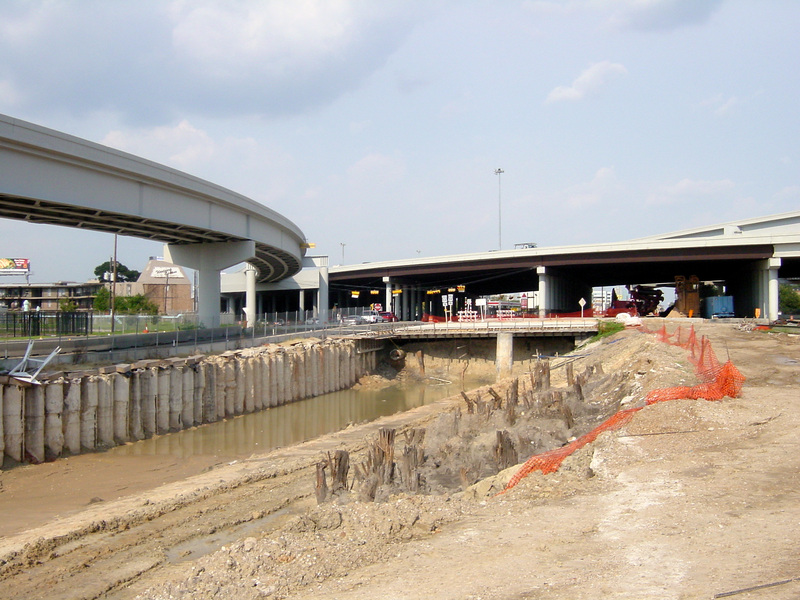 Excavation is in progress for the tollway, which will be below grade at this point. Notice the exposed wooden pilings in the photo. It appears that an old railroad trestle was uncovered during excavation. That is definitely a surprising find, since there are no streams anywhere in the area. 17-August-2003. 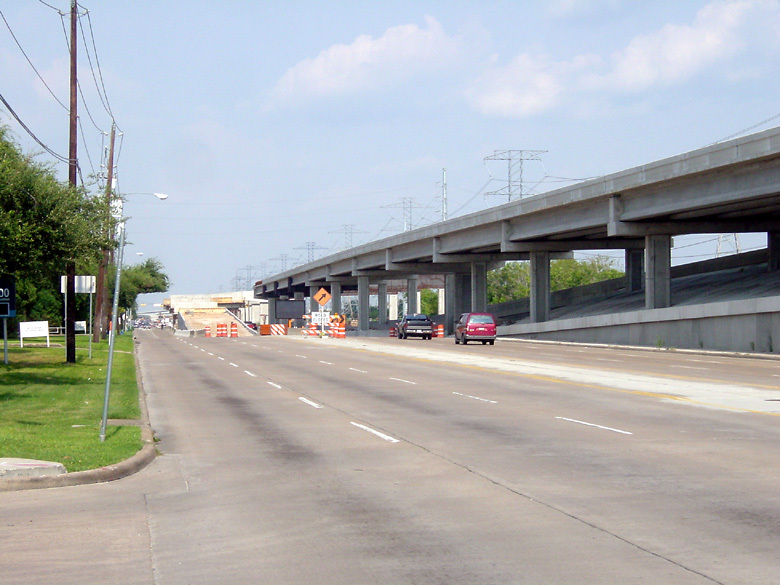 This view looks southwest along the Southwest Freeway (US 59), showing the connection ramp from the Westpark Tollway. 03-August-2003. (Click for high resolution) This view looks northwest along the Southwest Freeway from the Westpark Tollway connector ramp. 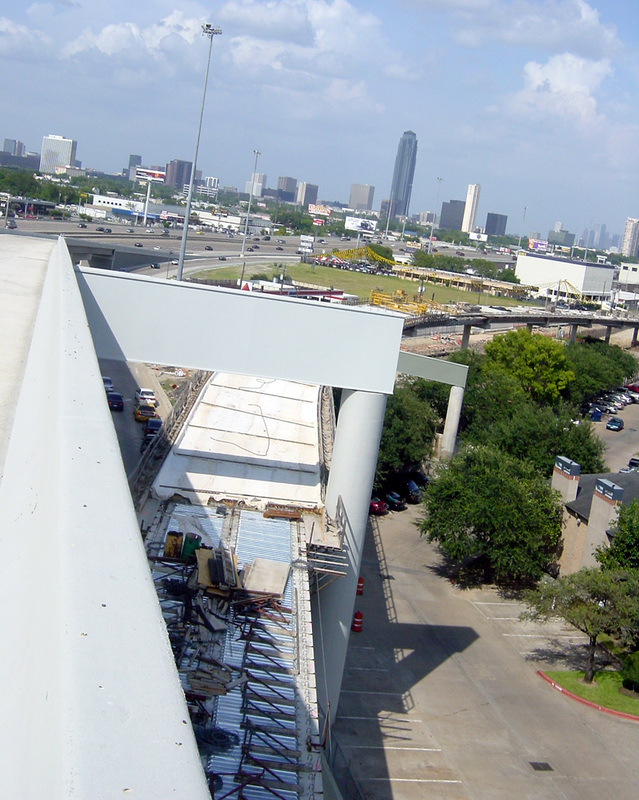 Tollway motorists will have good views of the Uptown/Galleria District from this ramp. 03-August-2003. (Click for high resolution) This view looks east-northeast along the Westpark Tollway with the connection ramp from the northbound Southwest Freeway in the foreground. 03-August-2003. 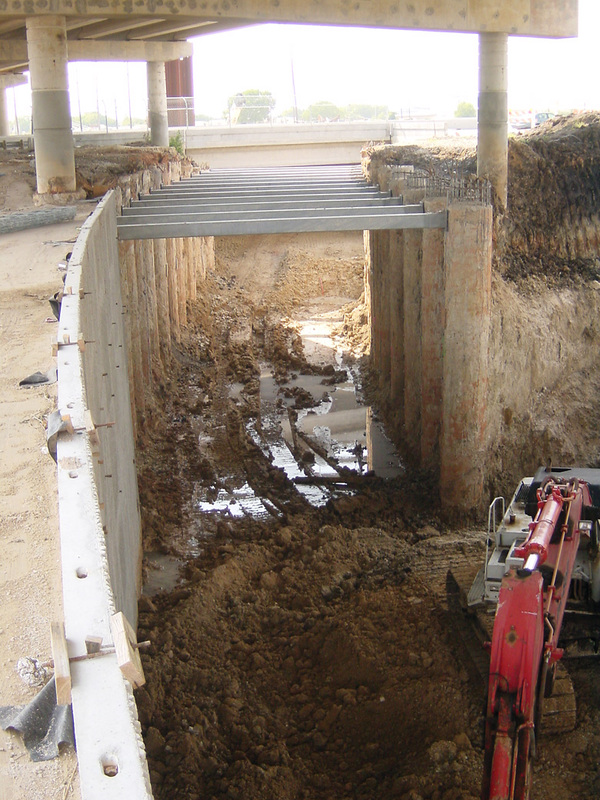 Another view of the ramp, this one showing how the high-level ramp is positioned over it. 03-August-2003. 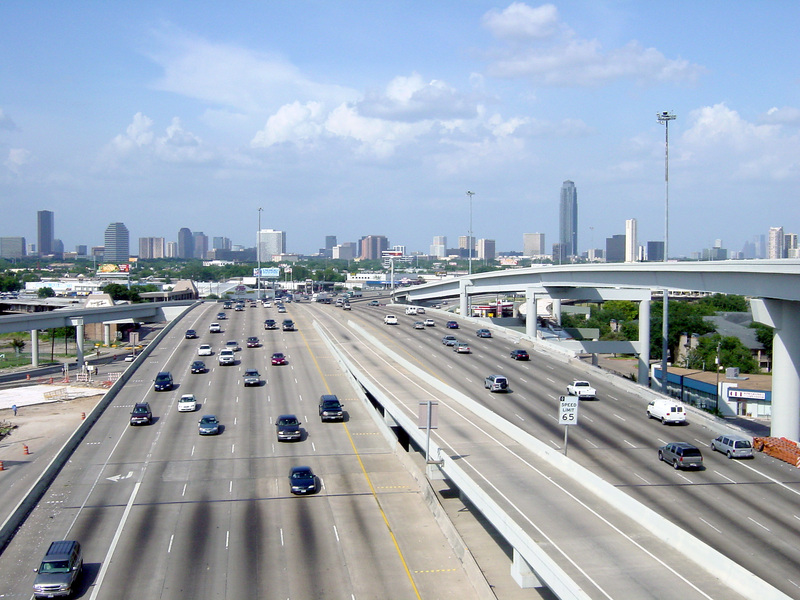 (Click for high resolution) This view looks east along the Westpark Tollway from the Southwest Freeway. 03-August-2003. 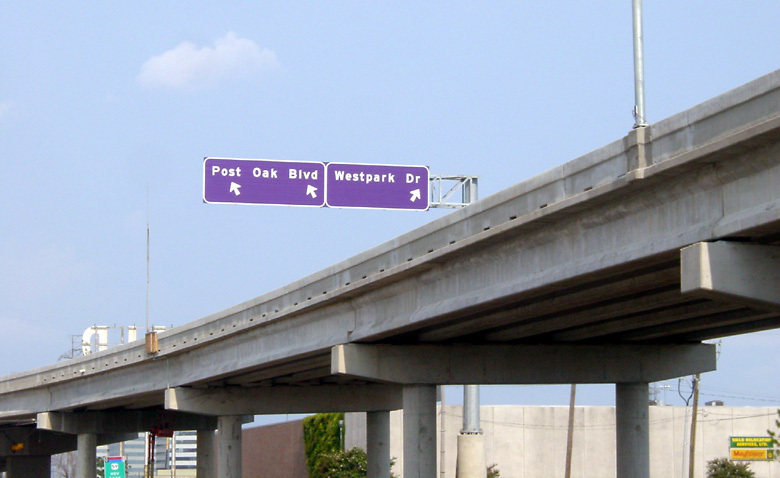 This view shows the Westpark Tollway elevated structure and the purple signs. As of October 2003, only a few signs near the eastern terminus are in place, so I don't know if purple signs will be used along the entire corridor. 17-August-2003. 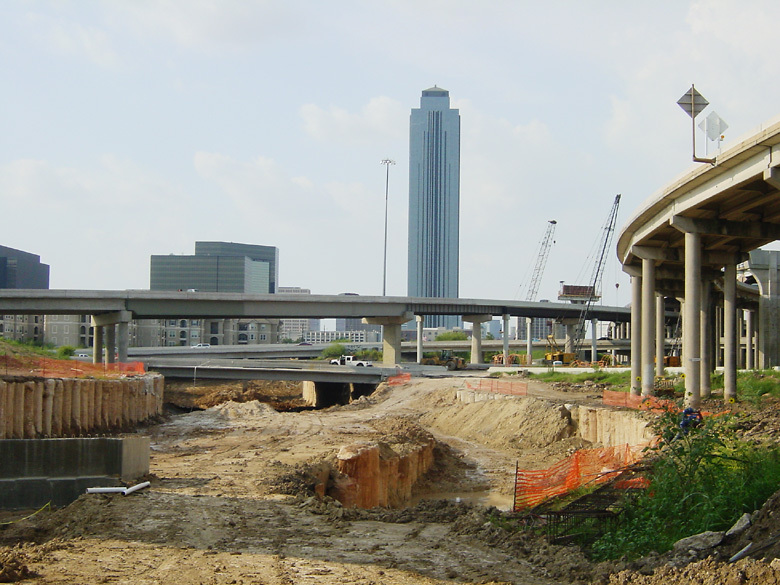 (Click for high resolution) This view looks north at the excavation for the Tollway terminus underneath the Southwest Freeway/Loop 610 interchange. 17-August-2003.